For anyone looking for that truly unique, highly personalised detail on their wedding ring, we have another great idea for you. Exclusive to Serendipity—available in-house or for UK, EU, US, Canadian and AU overseas orders, we can add your actual heartbeat into a wedding band, or apply this personalised effect to the outside. Choose either our dedicated wedding ring for this service, or select a style from any of our regular wedding ring designs, considering your precious metal, width and finger size required. Next decide if you would like us to take your heartbeat reading within our showroom or within the comfort of your own home. We can provide the means to take your reading at home. Just contact us for guidance and we can talk you through the process, step by step. The ECG monitor works with your iPhone or Android device enabling you to take a precise reading. We can offer complete guidance on this part of the process. We can begin crafting your wedding rings when you place your order, giving plenty of time to arrange your heartbeat reading. 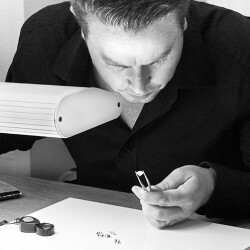 Once completed, we engrave your actual heartbeat onto your wedding bands to create a truly unique and personalised item of jewellery. Please feel free to email us info@serendipitydiamonds.com or jump onto online chat with us to discover more about this amazing new product.